Minister for Water and Power Khawaja Muhammad Asif today presided over the 110th meeting of Private Power and Infrastructure Board (PPIB) held in the Ministry of Water & Power. The Board was briefed that a number of upcoming projects based on affordable fuels like coal, hydro and RLNG are at final stages of completion to eradicate power outages. The 1320 MW Sahiwal Coal Power Project achieved Financial Close and started power generation after inauguration by the Prime Minister Muhammad Nawaz Sharif. Furthermore, 720 MW Karot Hydropower Project which is located at River Jhelum on dual boundary of Punjab and AJ&K has also achieved Financial Close and started construction. The Board was informed that the first unit of 2 x 660 MW Port Qasim Power Project will start generation in November this year while COD will be achieved in May 2018. The Minister said that the timely completion of upcoming power projects is very important for attaining the goal of zero outages for which present government desires PPIB to provide maximum facilitation in removing bottlenecks to avoid any hurdles or delays during the implementation of their projects. In order to ensure the implementation of Thar Coal based projects, the Board keeping in view the coal supply from the Sindh Engro Coal Mining Company (SECMC) approved timelines for Financial Close and COD of Thar Coal based power generation projects which include 330 MW Thar Energy Limited, 330 MW ThalNova Power Thar Limited, 660 MW Lucky Electric Power Company Limited and 330 MW Siddiqsons Energy Limited. 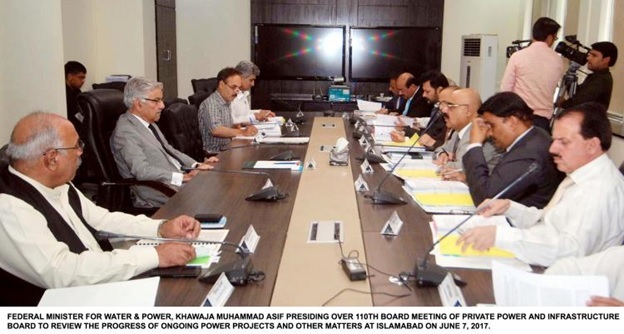 The Board also appreciated the initiative of China Power Hub Generation Company (Pvt) Limited regarding construction start of 2 x 660 MW Imported Coal based Project at Hub from its own equity to meet the COD date of August 2019. Ongoing power projects were also discussed in the meeting in context to the overall electricity situation in the country. Managing Director PPIB Mr. Shah Jahan Mirza briefed the Board on various power generation projects being handled by PPIB, particularly the projects being processed under China-Pakistan Economic Corridor (CPEC) and briefed the Board that the major chunk of CPEC program comprises of energy projects being processed by PPIB for which concerted attention is being given for timely completion. The Minister said that the Government is seriously working to bridge the gap between demand and supply of electricity to accelerate the socio-economic growth of the country and bring relief to the people. The Minister further added that the CPEC will lay the foundation of robust power sector of Pakistan and directed PPIB to vigilantly monitor the progress of all ongoing projects besides other new projects so that they may not face any difficulty or delay.